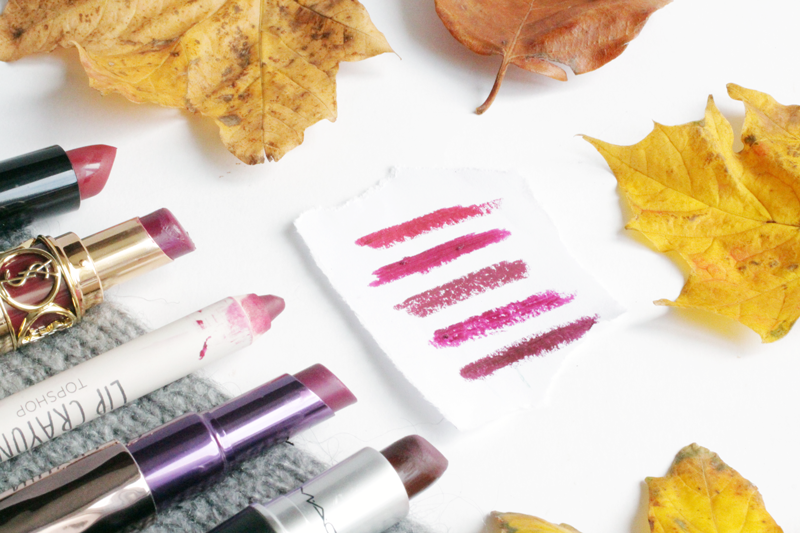 I know you’ve probably seen this type of post on a million other blogs, as bloggers + Autumn = everything berry toned, buuut I’m a sucker for that hue. Berry tones go well with my skintone and I think I suit them, so am always excited when this time of year rolls around so I can dig them out of my collection. 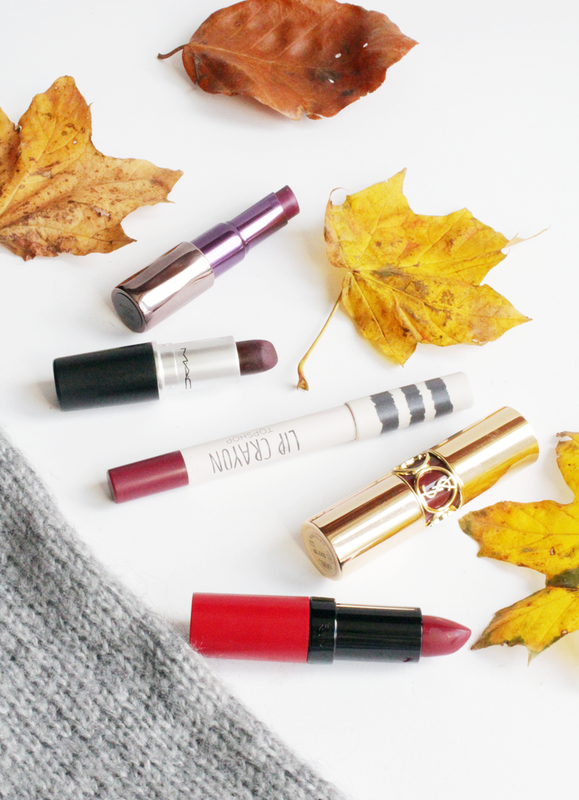 In today’s post, I thought I’d feature five of my favourite berry lipsticks, from different price ranges, to help you find the shade for you as owning one should be mandatory for AW. Starting with the top of the swatches, the Rimmel Kate Moss 107 is a classic for those looking to try the trend but don’t wanna invest too heavily. It’s a pretty shade that leans slightly to the warm side and lasts well on the lips. Perfect for those on a budget as there’s nearly always an offer on Rimmel too! Next is the higher end of the spectrum, but my favourite due to how wonderful the consistency is. The YSL Rouge Volupte in 12 Forbidden Burgundy is definitely the most rich and expensive looking (is that even a thing?) due to how pigmented and creamy it is. Lasts a good few hours before needed to be topped up and c’mon, you can’t really resist that packaging, can you? The middle of the range lipstick is from my favourite high street brand, Topshop. The Topshop Lip Crayon in Suspect is a darker, more cool-toned, true purple shade and one of my favourites to wear. It feels quite dry on the lips, but it means it lasts a long time and you can always pop a lip balm on top if needed. Topshop don’t seem to do the lip crayons anymore (at least online) but Inhibition look fairly similar! The Urban Decay Revolution Lipstick in Venom is a newer one in my collection but one I really like. It’s quite similar to MAC Rebel Lipstick, as it’s a bright berry shade with slightly pinky undertones, but a great one to go for if the dark purples aren’t yo thang. Finally, I couldn’t not include a MAC shade in the list and MAC Media is an oldie but a goodie. It’s a really dark shade, but quite wearable and it always comes out of my stash every Winter! I adore it. Let me know what shades you’re wearing this AW!